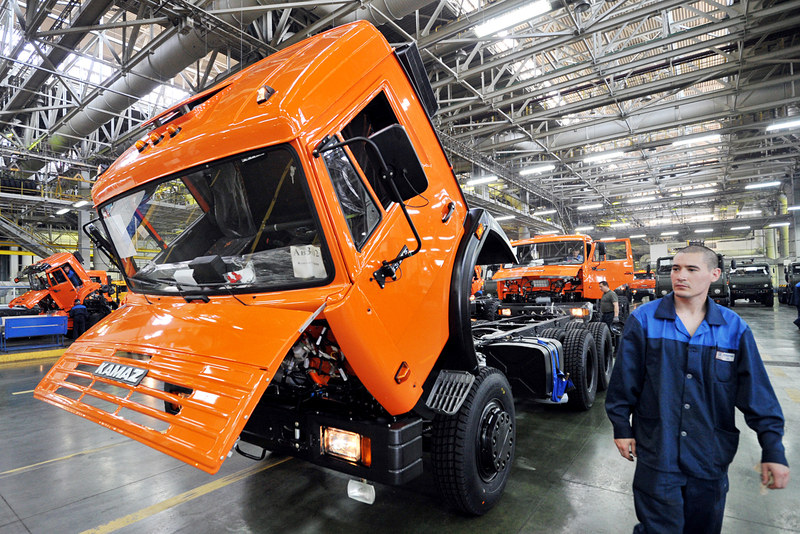 The body and chassis assembly shop at the Kama Automobile Plant (KAMAZ) in Naberezhnye Chelny, Tatarstan. The Eurasian Economic Union’s Minister of Trade Veronika Nikishina talks to RBTH about the Union’s s free trade agreement with Vietnam, and explains why a similar agreement with Singapore should cover services and investment, and not just reduced tariffs on goods. In late July, the Eurasian Economic Union (EAEU) ratified its first free trade agreement with a third country, Vietnam. In an interview with RBTH, EAEU Trade Minister Veronika Nikishina outlines what the Union has achieved in terms of cooperation with Asia-Pacific countries. The EAEU has received around 40 proposals for free trade agreements (FTAs) and quite a few of them from Asia-Pacific countries. Do EAEU countries offer some unique benefits to their potential partners? We do not conduct a dedicated promo campaign though the fact that the EAEU’s market is not yet as deeply integrated into global economy as many others makes it rather attractive for numerous trade partners across the globe and in the Asia-Pacific in particular. Look, in the Asia-Pacific region, practically all the countries have free trade arrangements with each other, so they take this preferential regime for granted. No Asia-Pacific country has such a trade regime with the EAEU yet (the FTA deal with Vietnam will come into effect in October 2016). Therefore, we have a limited presence in the markets of those countries. However, if the current rather protectionist regime is replaced with a more liberal one, the EAEU market would have a great potential for trade. This is perhaps what attracts Asia-Pacific countries. The FTA with Vietnam was ratified on July 28 and will come into effect in October. It is the first agreement of its kind for the EAEU with a third country. What are the main goals of such an agreement? The main thing that we hope for is an increase in trade, both export and import. This is what we have been working for. We are now undergoing a "mindset revolution" because in recent years the EAEU has persistently been developing integration within set borders, whereas integration with third countries was not a priority. The free trade agreement with Vietnam is the first case that is changing our approach. Before this free trade zone agreement was signed, some commentators in Russia warned that opening the country’s market to Vietnamese goods would be a disaster for domestic manufacturers. How did you address this problem? We decided not to cancel duties for commodities that are the most sensitive for EAEU countries. Duties on them either remain the same or are reduced with lengthy transition periods. How advantageous are the preferential terms that you managed to secure? Before the free trade agreement was signed, we had absolutely no competitive advantages on the Vietnamese market because other key trade partners – China, India, the USA, and others – had signed similar agreements with Vietnam before us. Once the FTA comes into force, the average level of duties on EAEU goods will drop from 10 to 1 percent. Thus, our goods will enjoy terms on the Vietnamese market that put us on par with our competitors. Once the agreement comes into force, which goods will have zero duty? Vietnam has reduced or eliminated its import duties on 91 percent of its goods' nomenclature. Zero duties will apply to beef, dairy products, tinned fish, flour, cereals as well as to rolled steel, pipes, asbestos, ships, petroleum products and many other categories of goods. The duty on petrol will be reduced from 19 to 0 percent with a transition period; on cables, from 20 to 0 percent over a period of 10 years; for large goods vehicles, from 17 to 0 percent. Vietnam has also agreed to partially liberalize access to its market for our tobacco products, while our automobile industry companies will be given exclusive access to the Vietnamese market. In return, the Eurasian Union will eliminate it's import duties on 88 percent of goods immediately or with a transit period of 5 to 10 years. Thus, Vietnamese producers will get preferential access to many consumer goods markets of the EAEU including clothes, shoes, fish, rice, fruits, vegetables, consumer electronics. What does the exclusivity for the automobile industry consist of? Vietnam has signed an investment agreement on the industrial assembly of cars and trucks with companies from Russia and Belarus. Assembled vehicles will be considered as manufactured in Vietnam and will thus have free access to the markets of ASEAN member states. When it comes to an FTA, which Asian country is next on the list? We are developing our integration roadmap and prioritizing potential partners guided by our advantages and risks and also with a view to smoothly adapt our countries’ industries to a new foreign-trade regime. We have no intention of integrating for integration’s sake or doing it in retaliation for the establishment of regional trade blocs. As for the next countries on the list, this year we have signed memoranda of cooperation with Cambodia and Singapore. What is your vision for cooperation between the EAEU and ASEAN as an economic community? To be present on that market, we need a competitive trade regime. However, it cannot be achieved with a single decision, at one stroke, by simply creating a free trade zone between the EAEU and ASEAN. We are currently identifying individual countries, a set of bilateral agreements, which in the future might lead to a multilateral agreement. We have sent an offer to sign a memorandum on cooperation to the ASEAN Secretariat. Though so far the Secretariat has not found this proposal interesting, we have seen interest from individual member states. We are just at the start of this journey, but we are giving it our all. What are your plans with regards to Singapore? We intend to launch a joint feasibility study group with Singapore before the end of this year in order to identify potential benefits for both sides. Under our rules, before starting negotiations on a free trade zone, we must present the results of this group’s work to the leaders of the five EAEU member states and receive a mandate for further talks. What are your views on a FTA with Singapore? There is one nuance when it comes to Singapore. A classical trade agreement envisages a liberalization of duties, i.e. trade in goods. However, the bulk of our five member states’ relations with Singapore lay not in the transfer of goods but in services and investment. That is why a simple reduction of duties with Singapore will not benefit EAEU countries. Our exports to Singapore practically entirely consist of energy goods. We do not sell anything more substantial to Singapore. Duties in Singapore either already amount to zero or are very low. That is why as far as tariffs market access for our goods is concerned, there is nothing for Singapore to reduce any further. Whereas Singaporean goods – albeit they are not very numerous on our market – do need to have duties on them reduced. We would be more interested in a free trade agreement with Singapore to include – in addition to duties –provisions on services and investment. However, under EAEU rules, services and investment fall under the competence of member states and the EAEU does not have a mandate for holding these talks. Having said that, the EAEU is evolving and time has come to ask the leaders of the five member states whether they consider it possible to expand the EAEU mandate, perhaps not systemically but for individual cases, like with Singapore. Will EAEU open to China? Is a FTA with China possible? During Vladimir Putin’s visit to China in June, the EAEU signed a cooperation agreement with China. What does that agreement envisage? With China, we are preparing an economic cooperation agreement, not an FTA at this stage. Our member states are not yet in a position for a deep market opening, we need to create better starting positions including greater transparency, mechanisms to tackle high non-tariff barriers that are currently affecting our exports. Given the fact that the EAEU did not have any regulatory relations with China since each member state resolved such issues individually, the simple streamlining of dialogue will be a huge step forward. First, we need to understand our differences with China when it comes to non-tariff regulations, and then find access routes and only then start discussing a free trade agreement. What kind of problems do non-tariff regulations create? For example, China would not certify EAEU meat producers in terms of veterinary and sanitary requirements. In terms of technical regulations, the issue is that our standards and procedures significantly differ and for our producers it happens to be a challenge to meet all the regulations of Chinese market. Yet we lack a developed mechanism for trade facilitation in this regard. In order to address this problem, we will explore possibilities to elaborate on our standards and procedures in order to facilitate trade flows. And only after that, could we start discussing a reduction in duties; otherwise it would be pointless. Over the past few years, China has become an e-commerce leader in EAEU countries, whereas EAEU member states have so far been unable to launch an effective e-trading platform in China. Why? The problem is in non-tariff regulation again. Chinese regulation is fundamentally different from regulation in EAEU countries and is extremely tough. For instance, when we receive goods purchased online, they do not have to meet the technical requirements of the EAEU. This is not the case in China. Even if we set up a channel for consolidating our goods that would offer competitive prices, the fact is that in China these goods have to meet local technical requirements (that our producers are not always aware of and do not know how to meet compliance with) makes this trade impossible. These goods would not even become illegal because they will never make it to the Chinese market: they will simply be sent back.